One of my favorite things about teaching at quilt shows is that it gives me an opportunity to interact with my students on a face to face basis. This ‘up close and personal’ interaction seems to make students feel more comfortable about asking basic nuts and bolts questions about how to achieve a more professional finish to their quilts. One of the most common questions I hear when chatting with my students is “How can I avoid getting puckers and tucks on the backs of my quilts?” Whenever I am asked this question, I answer it by asking the student to tell me about how they prepare and load their backing fabric. In doing so, I find that approximately 90% of the time these quilters are setting themselves up for problems by not paying attention to the backing fabric when prepping for the quilting process. Fortunately, this problem has a very easy fix and if the quilter is willing to make a few simple changes to their prepping and loading process they can dramatically reduce, and even eliminate, those pesky puckers. Let’s face it; nobody likes to take a quilt off of the frame, flip it over, and find stitched-in wrinkles that will require hours and hours of ripping and re-quilting! In my column entitled ‘The Importance of Being Stable,’ which can be found in the March 2012 issue of this magazine, I touched very briefly on the subject of how backing fabric provides foundational stability for the rest of the quilt. Because so many people have contacted me to ask for more information on this subject, I would like to expand on it here. The backing is an integral part of your quilt no matter how you accomplish the quilting but, when frame quilting, it is especially important that you pay attention to what’s going on ‘behind the scenes.’ Because it’s so difficult for us to see what’s going on with the back as we work, we need to pay extra attention to little details before we ever put the first stitch in the quilt. 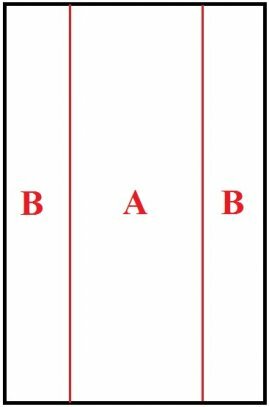 As mentioned in my previous column, your batting and quilt top do not have much stability of their own and if they were to be quilted alone they’d be a wavy train wreck. However, when we add a stable backing fabric into the mix, the results are considerably better. The first step is to ensure that your backing fabric is able to provide maximum stability and this is best accomplished by purchasing a high quality fabric. Too often, we pinch our pennies when it comes time to purchase our backing. We’ve spent a lot of money on all of those beautiful fabrics for our quilt top and then we spent even more on a big fluffy package of batting. When faced with the prospect of buying numerous yards of fabric for the back of the quilt, we tend to think “It’s just the back; who cares what it looks like?” and we buy the cheapest yardage we can find and call it good. While this is great for our wallets, it’s not always so great for our quilts. While I have nothing against sale fabric (I am proud to be a cheapskate!) it is important to remember that, in the case of our quilt backs, *good* fabric is a much wiser buy than *cheap* fabric. Not only will a strong fabric with a firm weave add years of wear to your finished quilt, it will also add immeasurably to the stability and straightness of the finished quilt. The next thing to take into consideration is how best to seam your backing fabric. If your quilt is more than 40 inches wide, you’re either going to have to buy a wide backing fabric or you’re going to have to seam your standard fabric to create the necessary width. 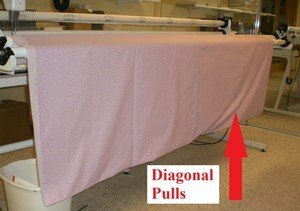 Most people just seam together two or three pieces of fabric that are identical in length and width, line up those seams so that they’re right smack in the middle of the back, load the fabric on the machine and start quilting. If this is your usual mode of operation, please allow me to suggest several changes. and putting that seam right where it’s going to get the most stress, try dividing piece B in half and attach those halves on either side of piece A as shown in Photo C.
This allows you to create a backing fabric that is the correct width for your quilt top, but moves the seams out of the area most likely to be folded. 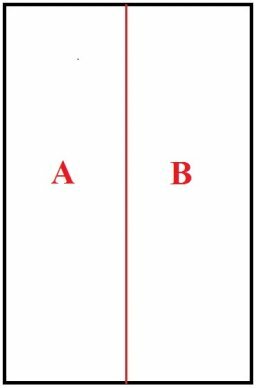 As you can see in Photo F, there are ‘pull’ lines running diagonally across the backing, indicating that this backing is not folded so that it hangs straight and on-grain. 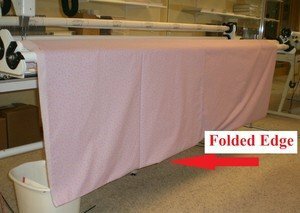 Now, fold your fabric again one or more times until it is of an easily handled width, take it to your cutting table and, using your rotary cutting tools, cut straight edges along the top and bottom ends. 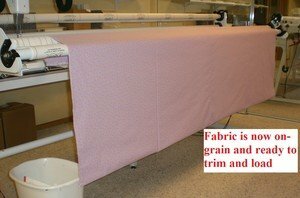 This process, which takes only two or three minutes to complete, will give you a nice, stable, on-grain backing fabric with perfectly straight edges and will help you to virtually eliminate creased and puckered quilt backs. The last (but certainly not least!) 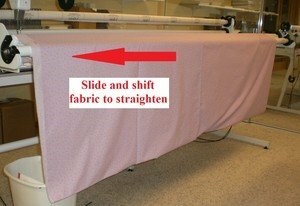 step is to make sure that when you are pinning on your backing you do so with the seam(s) running parallel to the rollers rather than perpendicular to the rollers. The reason for this is simple; the seams, even though they’ve had the selvages removed, are still much tighter than the rest of the backing fabric. 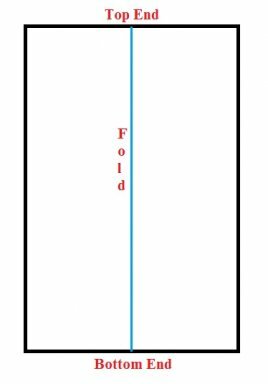 If you load the backing so that the seam runs from roller to roller instead of parallel to the rollers, you will find that your seam is very tight and the fabric to either side of the seam droops like a hammock between the left edge and the seam, and the seam and the right edge. During the quilting process this droopy, loose fabric will have to go someplace and the place it usually goes is right into a big fat wrinkle. Since our quilting machines are set up in such a way that we rarely see the back side of the quilt until we remove the quilt from the machine, those big fat wrinkles are likely to be stitched neatly in place by about 7000 stitches long before we even know they’re there. In order to avoid this, simply make it a point to load your backing so that the seam runs horizontally rather than vertically. If, for some reason, you find that you must load the backing so that the seam(s) run perpendicular to the rollers you should take the following precautions while quilting; each time you advance the quilt and expose a new work area, reach down underneath the quilt and give a gentle little tug or two on the seam (tugging it away from the backing roller and toward the takeup roller) to loosen it up a bit. If you peek under the quilt before tugging, you’ll see the loose ‘hammocks’ to either side of the tight seam. If you peek again after tugging, you’ll see that the hammocks have disappeared and the backing will appear to be of equal tension across the entire width of the work area. I hope that you’ve found these tips to be helpful to you and I hope that they will help you to avoid excess frustration, ripping, and cussing. I think you’ll find that it’s well worth your time to take a few minutes to attend to the ‘forgotten’ layer of your quilts. Remember; behind every great quilt is a good backing!